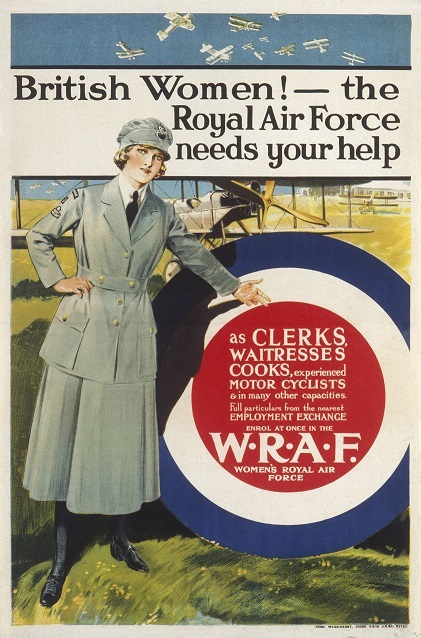 There were four categories of work for members of the WRAF: A – Clerks and typists; B – Household such as cooks, waitresses and domestic workers; C – Technical such as tinsmiths, photographers, metal workers, wireless operators and carpenters; and D – Non-Technical or General, which included tailoresses, shoemakers and motor cyclists. The majority of the work was for clerks and typists. The household workers endured the toughest work and the longest hours. The technical section offered the greatest range of employment and was one of the few sectors during the war where women were trained for skilled positions. The WRAF was nicknamed the ‘Penguins,’ because, like the birds, they did not fly. All issues of discipline, leave, medical services, welfare and discharges were controlled by women officers. However, in some bases, women officers were scarce. Alice Chauncey, who became Company Commander for the WRAF, explained in the RAF’s Spirt of the Air publication, ‘There were camps where several hundred Immobile women were employed in aeroplane making, storekeeping, and all manner of Air Force trades, yet there were no officers in the camps, and discipline was beginning to suffer.’ More officers were recruited and the organisation transformed into a disciplined body of women.